Ipiales is a small town on the border with Ecuador. It sits at an altitude of 2900m and is cold by Colombian standards. Like most border towns, it's fairly dull and uninteresting and travellers rarely spend more than a night here. 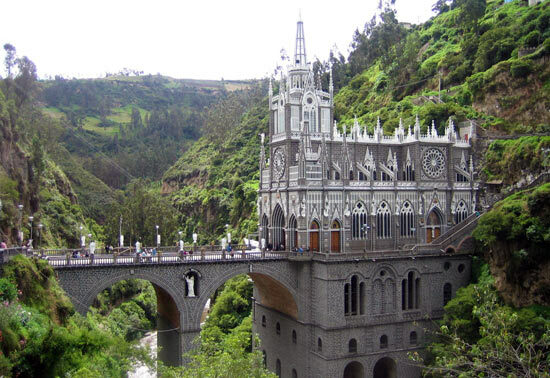 El Santuario de Las Lajas (Sanctuary of the Virgin of Las Lajas) is a magnificent neo-gothic church built over a gorge about 7km south-east of Ipiales. The image of the Virgin Mary is thought to have appeared in the rock face around 1750 and the church was built to commemorate this with the rock on which the Virgin appeared forming the altar. A large stone bridge spans the gorge from the entrance to the other side. 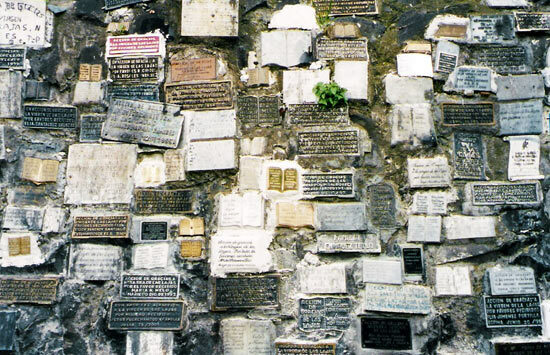 As you walk down to the church from the village where the buses or taxis drop you off you will see, on your left, a wall containing hundreds and hundreds of plaques thanking the Virgin for miracles. To get to El Santuario, take a colectivo (small bus) from Carrera 6 with Calle 4. Or alternatively take a taxi. When you've finished your sightseeing at El Santuario you can easily catch a bus or shared taxi back into town. In the village and also around the gorge there are plenty of places to get a bite to eat. For somewhere to stay try Hotel Don Lucho: Carrera 6A # 11-64, Tel. (2) 7732164. A decent, although basic, place with hot showers and cable TV. Another option is Hotel Belmonte: Carrera 4 # 12-111, Tel. (2) 7732771. A basic, but friendly hotel a block away from Plaza la Pola. Let's face it, border crossings are never much fun, but this crossing is actually not that bad if you just keep your wits about you. The border with Ecuador is formed by a gorge formed by the passage of the Rio Carchi. A road bridge brosses the gorge and the Colombian and Ecuadorian immigration offices are situated on their respectives sides. The process is relatively simple. First, present your passport to the immigration office of the country you're leaving to collect your exit stamp. Then walk across the bridge to the immigration office of the country you're entering and again present your passport to receive your entry stamp. The thing is, Colombians or Ecuadorians will probably only present their cedula (identity card) and you may be fooled into thinking that you don't need to show a passport. From Ipiales buses run to the border from the corner of calle 14 and carrera 10. Once you have completed the immigration formalities you can catch another bus on the Ecuadorian side to Tulcán, or vice versa if you're coming from Ecuador. On entering Colombia from Ecuador, many travellers' first stop is the beautiful colonial city of Popayan.